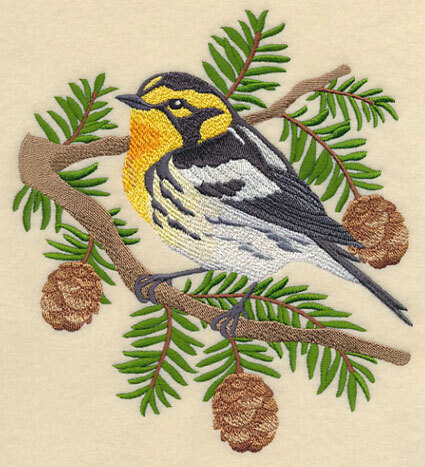 All of us at Embroidery Library are thankful for your creativity. 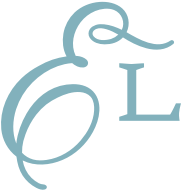 Each week our inboxes overflow with the most interesting and excellent ideas for new designs! is outstanding! 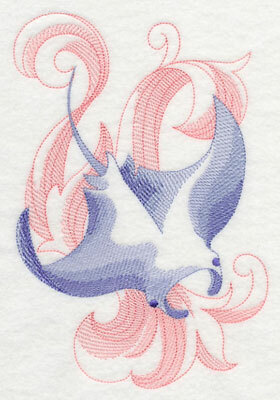 Ideas range from colorful birds to floral sprays; sea life to quotes about camping. Scroll down the page to see the variety, and let your creativity run wild! 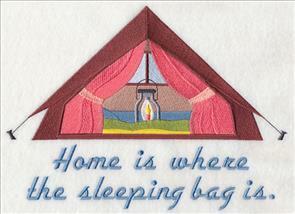 Brighten up tote bags and pillow shams with the birds; frame the quotes and decorate your camper. 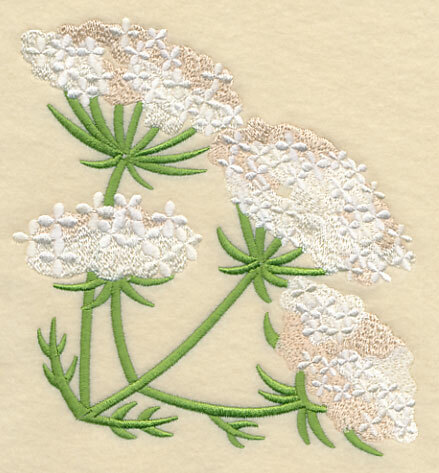 And, keep an eye out for the Queen Anne's Lace, which has been requested by many. Rectangles and sprays lend an eye-catching look to this tote bag. Click here for free project instructions! Painted Buntings are a species of bird in the Cardinal family, and their brilliant feathers make it seem as if they've flown straight out of a child's paint-by-numbers book. 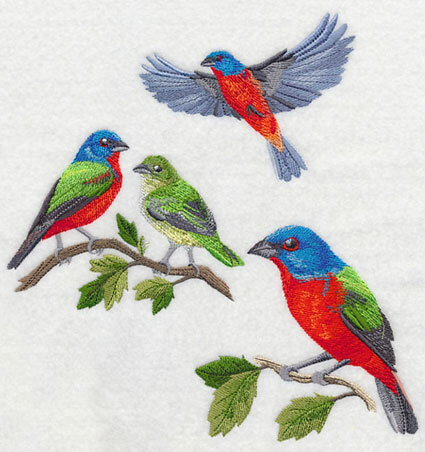 Vivid hues of blue, yellow, green, and red dress up the birds in the collage below. 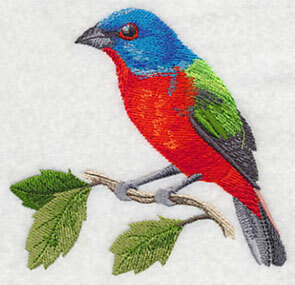 Requested by Linda, Painted Buntings are a gorgeous addition to tote bags, wall hangings, pillow covers, and more. 8.34" x 8.56" and 7.60" x 7.80" and 6.86" x 7.04" and 5.85" x 6.01" and 4.85" x 4.99"
A Painted Bunting soars in flight, and a pair perch on a branch. Lovely on pillow covers! 4.89" x 3.77" and 3.42" x 2.64"
The French name of the Painted Bunting, "nonpareil," means "without equal," a reference to the bird's dazzling plumage. 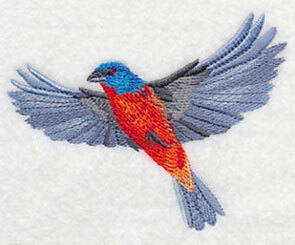 Add brilliant color without equal to your embroidery projects. 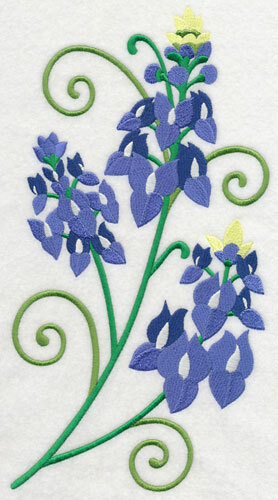 4.53" x 4.35" and 3.17" x 3.04"
The Flourishing Sprays are a favorite of embroiderers for their unique shape and their simply elegant flowers. Vicki requested sprays of roses and bluebonnets in the same style. Add colorful floral fashion to pillow covers, tote bags, wall hangings, towels, and more. 5.99" x 11.75" and 4.80" x 9.41"
6.27" x 11.76" and 5.02" x 9.41"
and 4.17" x 7.81" and 3.67" x 6.87"
Stunning colors mark the Blackburnian Warbler, making this petite bird really stand out from the crowd. Blazing orange feathers highlighted by black and white plumage create a treat for the eyes anywhere you stitch this Northeastern songbird, requested by Rachelle. 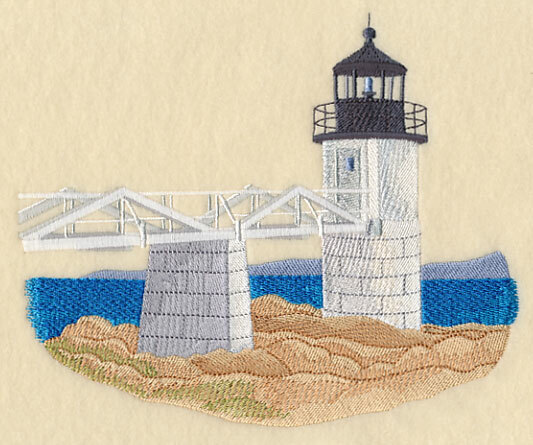 6.90" x 7.61" and 5.86" x 6.47" and 4.86" x 5.36"
The Marshall Point Lighthouse, requested by Diane, is placed on a rocky ledge at the tip of Maine's St. George Peninsula, where it overlooks both Muscongus and Penobscot Bays. It is a very old lighthouse, dating back to 1831 when the U.S. government bought the four acres of land it sits on for $120 from Samuel Marshall. Handsome on pillow shams and wall hangings. 7.06" x 5.85" and 5.85" x 4.85" and 3.85" x 3.19"
Edna and B. loved the Deep Sea Baroque designs, and requested additions of new ocean creatures and beach shells in this graceful style. Add an ocean fresh look to beach bags, towels, after-swim cover-ups, and summer tees. 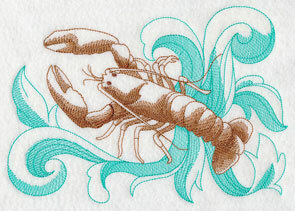 Also lovely on quilts and bath towels! 5.83" x 8.11" and 4.83" x 6.72" and 2.78" x 3.87"
A clam shell and a sand dollar are highlighted by light yet bold baroque flourishes. 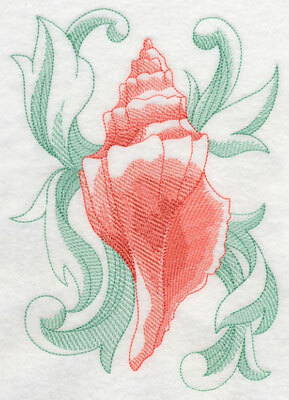 Bring the beauty of the sea to kitchen decor with seashell designs on flour sack and tea towels. 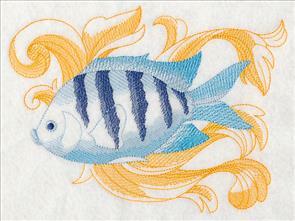 5.83" x 9.04" and 4.42" x 6.85" and 2.48" x 3.85"
An Angelfish and a Sergeant Major swim through the ocean blue. 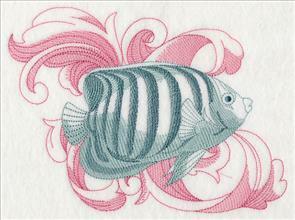 The Sergeant Major earns its name from its brightly striped sides resembling the insignia of a military sergeant major. 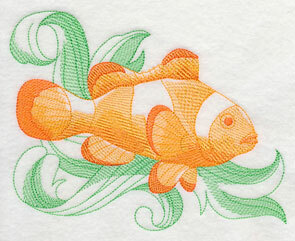 7.84" x 5.83" and 6.49" x 4.83" and 3.87" x 2.88"
A Clownfish brightens deep waters, and a Lobster swims against a rolling waves backdrop. Freshen summer tees with these light nautical designs! Also terrific on towels. 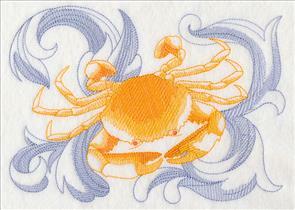 8.31" x 5.83" and 6.84" x 4.79" and 3.87" x 2.71"
Get a little crabby! Add a dash of color and just a "pinch" of baroque style to tees and totes. 8.23" x 5.84" and 6.82" x 4.84" and 3.86" x 2.74"
Deep Sea Baroque II designs bring classic nautical fashion to decor and apparel. 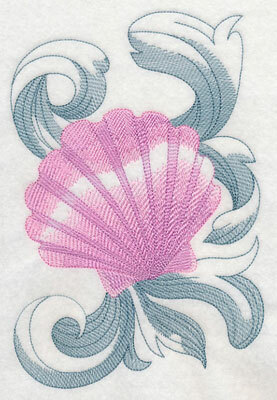 Baroque backdrops set off sea creatures and shells in light, quick-stitching embellishments. Angela requested this optimistic design with the fresh philosophy of "When life gives you lemons, squeeze 'em in your tea." 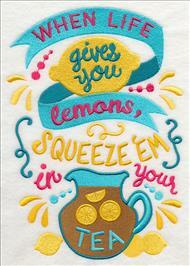 Stitch this cool, refreshing saying onto tote bags, wall hangings, aprons, pillow covers, and more for a zesty reminder to see the tea glass half full. 6.85" x 9.76" and 5.48" x 7.81" and 4.81" x 6.85"
Pleased with the I Love My Garden design but seeking something with a little more sugar, Sandra requested an "I Love Baking" design in the same style. 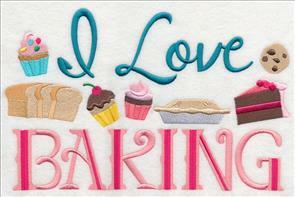 Delicious baked treats make a tasty addition to kitchen towels, aprons, wall hangings, and market bags. Bon appetit! 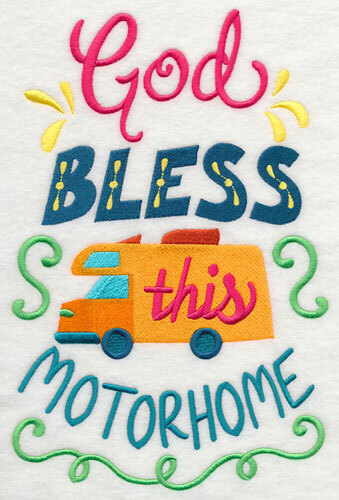 10.91" x 6.86" and 9.31" x 5.86" and 7.81" x 4.91" and 6.84" x 4.30" and 3.88" x 2.43"
Georgie requested this moving design proclaiming "God bless this motor home." 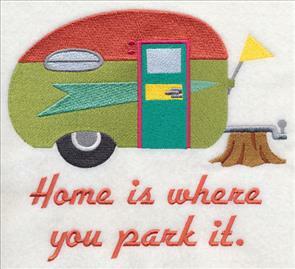 A fun design for anyone whose home away from home is on wheels. 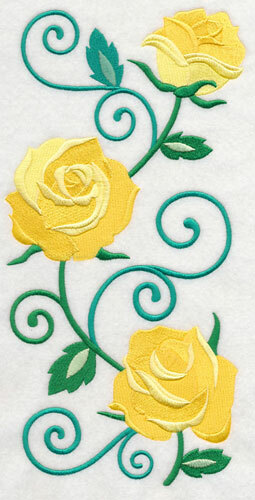 Perfect for pillow covers, wall hangings, framed embroidery, and mini-quilts. 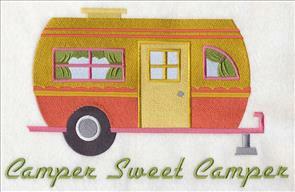 6.86" x 10.35" and 5.86" x 8.84" and 5.18" x 7.81" and 4.55" x 6.86"
Deb requested camping designs in a fun retro style. 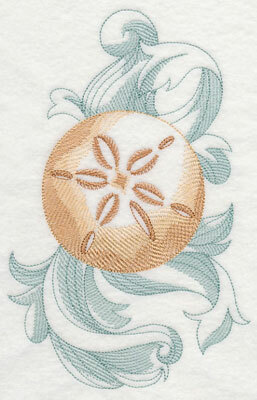 Colorful and sleek, these designs are as sweet as s'mores on wall hangings, towels, pillow shams, tote bags, and more. Stitch a bit of adventure, and may the forest be with you. 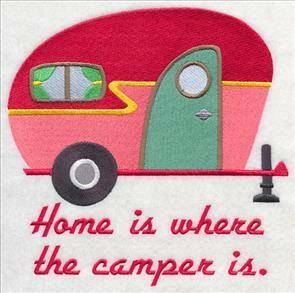 11.10" x 6.86" and 9.38" x 5.80" and 7.80" x 4.82" and 6.85" x 4.24"
You'll be a happy camper when you stitch these "Camper Sweet Camper" and "Home is where the sleeping bag is" designs onto decor and gifts. Keep calm and camp on! 9.40" x 6.86" and 7.81" x 5.70" and 6.63" x 4.84"
There's a saying that no one in an RV ever asks, "Are we there yet?" 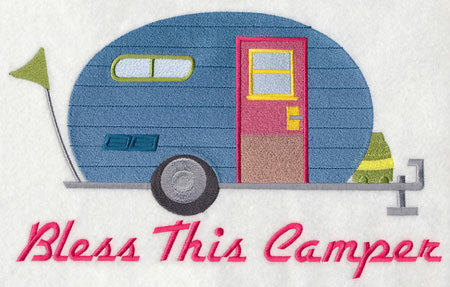 Canned ham campers are a nod to yesteryear and still a popular way to hit the road and head for the great outdoors. 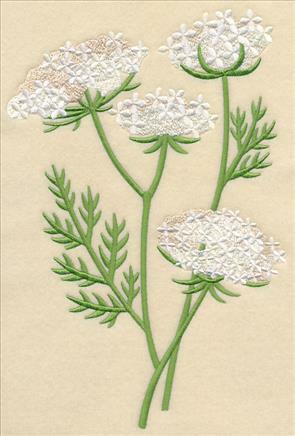 7.65" x 6.86" and 6.53" x 5.86" and 5.41" x 4.85"
Add a light floral embellishment to towels, tote bags, wall hangings, and more with lovely Queen Anne's lace, requested by Marva. Two features, a border, and a corner let your imagination bloom with project possibilities! 6.86" x 9.10" and 5.86" x 7.77" and 4.86" x 6.44"
Delicate leaves and stems compliment tiny blossoms in a graceful flower arrangement for placemats, napkins, and table toppers. This design has been formatted for the Endless Hoop; may also be used in standard hoops. 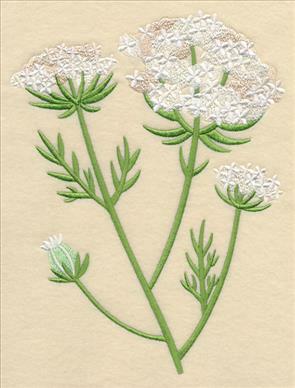 11.76" x 4.00" and 9.41" x 3.20" and 7.80" x 2.66" and 5.99" x 2.31" and 3.85" x 1.59"
Plant a Queen Anne's Lace corner on pillow covers and towels. A member of the carrot family, this flower is also called wild carrot, bird's nest, and bishop's lace. 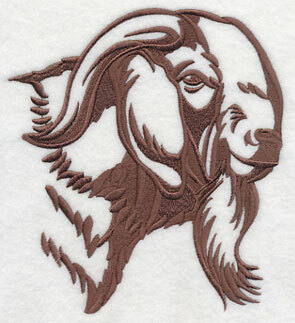 Commonly seen in dry fields and open areas, it's a naturally beautiful addition to your embroidery projects. 5.85" x 5.93" and 4.85" x 4.92" and 3.80" x 3.85"
Add white flowers with a lacy look to towels, linens, pillow shams, quilts, and more for ever-blooming, delicate blossoms. Get the design pack for the entire bouquet -- and the best price. Order the designs individually by clicking the links above, or get the pack with all the designs. Four sizes are available to suit any project. The XL, Lg, and Md packs contain 8 designs. The Sm size pack contains 6 designs. Click on a link below to see the designs in the pack, and add the pack to your cart. 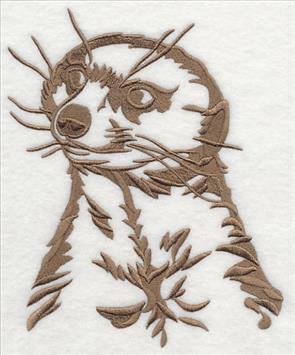 Sue is a fan of meerkats, and thought they would make good subjects for embroidery. Once you get a glimpse of these cool "kats," we think you'll agree! 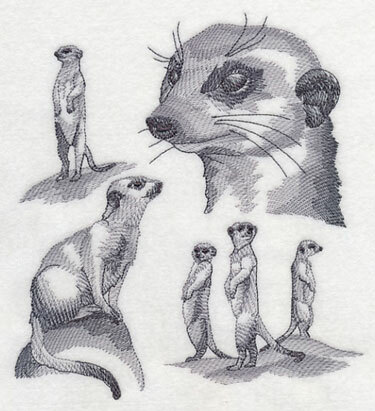 Clever meerkats have received a lot of attention in movies over the years, in everything from The Lion King to their self-titled "The Meerkats." Stitch a sketched medley of these vital animals for a very popular look. 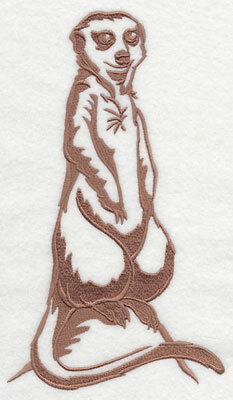 6.89" x 7.50" and 5.85" x 6.41" and 4.83" x 5.27"
One-color silhouettes are almost as quick to sew as meerkats themselves. Standing in a characteristic upright pose, and with an inquisitive expression, they bring natural flair to towels, T-shirts, tote bags, and more. 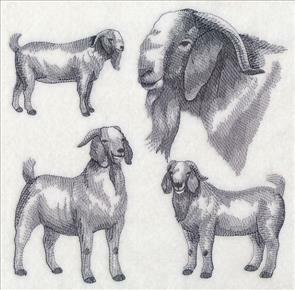 5.85" x 7.27" and 4.87" x 6.05" and 3.11" x 3.86"
Judy requested Boer goats, developed in South Africa in the early 1990's. Their name comes from the Afrikaans word "boer" which means farmer. Boer goats are very healthy, the does take excellent care of their offspring, and they are well adapted to hot, dry semi deserts, making them one of the most popular breeds of goat in the world. 5.86" x 6.53" and 4.86" x 5.42" and 3.47" x 3.86"
The final request is the regularly featured Special Request of the Week, where one customer's creative suggestion is highlighted every week. 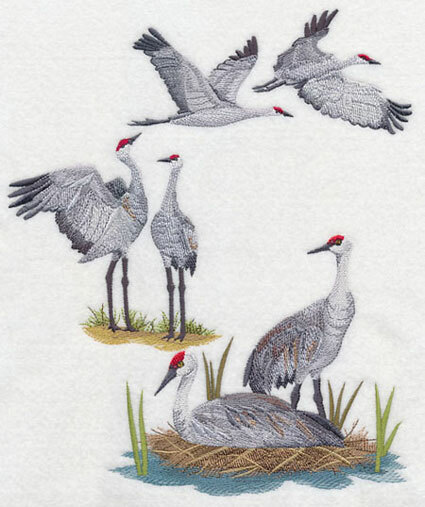 Teresa and Dianne both requested Sandhill Cranes, an elegant species of bird that inhabits open wetlands, fields, and prairies across North America. They flock together in large numbers, filling the air with their distinctive rolling cries. 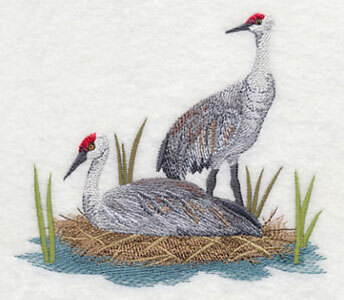 Let them nest on your next embroidery project! 8.60" x 10.39" and 6.86" x 8.30" and 6.43" x 7.78" and 5.86" x 7.09" and 4.85" x 6.85"
Readily identified by their crimson caps, Sandhill Cranes are known for their courting dance, when they stretch their wings, bow, and leap into the air in a graceful and energetic dance. 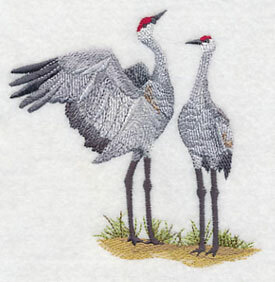 4.59" x 4.65" and 2.77" x 2.91"
Sandhill Cranes mate for life and stay with their mates all year. Chicks can leave the nest within eight hours of hatching. 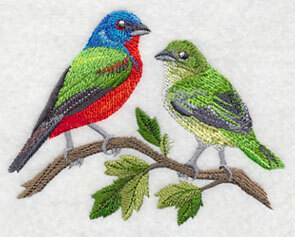 Stitch this realistic pair onto pillow shams, quilts, and more. 5.13" x 4.45" and 3.81" x 3.31"
Are you wondering how to request a design? Send an email with your suggestion to us at support@emblibrary.com.